The start of the year was a challenge for much of the industry, but at least the data is consistent as we pull up the new Chain Store Guide Drugstore Dashboard. Total US pharmacy and drug store sales were down in the first quarter, a state of affairs reflected in the latest earnings reports for CVS, Walgreens and Rite Aid, all of which saw declines in comparable store sales. CSG’s own polling data and our Consumer Spending Report also point to the idea that consumers are slightly less inclined to open up their pocketbooks than they’ve recently been. 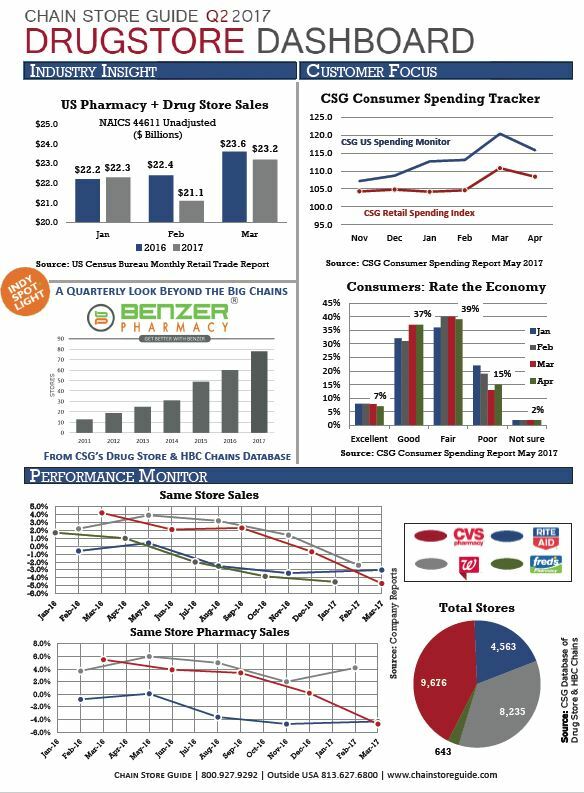 On a more positive note, the dashboard’s Indy Spotlight falls on Benzer Pharmacy, a Tampa-based pharmacy that CSG projects will increase its store count by approximately 30% this year through a combination of acquisitions and franchising.